To get the special which is good on stays through May 27, 2019- please book two or more nights and then let me know which night to add for your free night. One discount per stay and must be requested at time of booking. 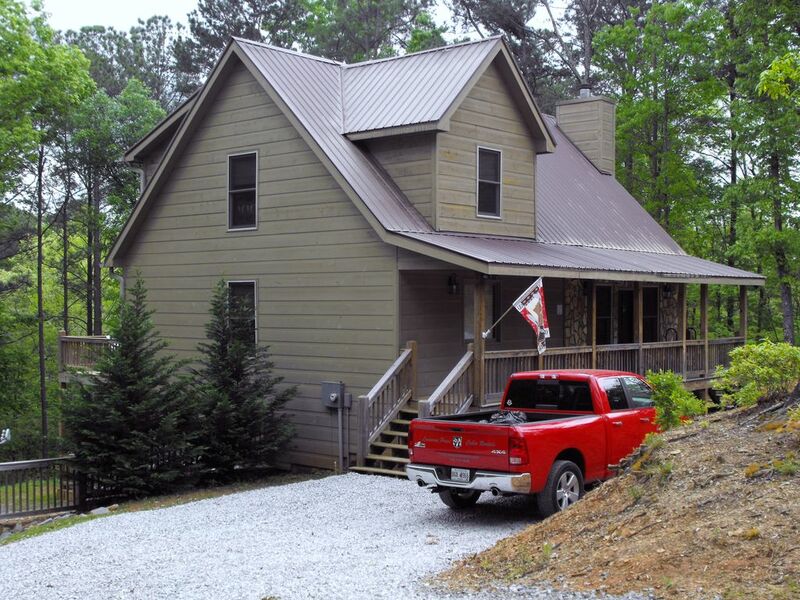 Ponderosa Ranch is a 4 bedroom 3 1/2 bath cabin located in the Coosawattee River Resort. Saddle-Up partner, really! You can watch your favorite western sittin’ tall in the saddle that you’ll find in the living room. The wild west theme has been taken to a new level with this cabin. Everything from the saddle to the long horns to the cow hide rugs to the numerous details that fill the gaps reflect the rustic feel of “The Wild West”. So get yer saddle bags packed partner cuz The Ponderosa Ranch is the best place to go when you and you’re posse of 14 or less RIDE OFF INTO THE SUNSET! beds are made fully with sheets and pillow cases. Comforters and blankets. Yes. Per person towels are provided. Full kitchen with stove, fridge, microwave. Cookware, bake ware, dishes, glasses, mugs etc. Toaster, can opener and coffee maker. Has dishwasher and garbage disposal. Pontoons available at Carters Lake. 10 miles from cabin. A card can be purchased for $85.00 to use resort pool/ mini golf. They have a maximum of 8 people that can go per day. A pass can be purchased to use the resort pool/mini golf facility. Use of river, fish pond and resort grounds do not require this pass. Water tubing on site. We loved it. Beautiful cabin. Will be staying again! Wall on back room in basement was covered in black mold. Commercial grade dehumidifier in corner of basement was unplugged. Grandchildren tried to sleep downstairs the 1st night, but had to move upstairs during the night due to bloody nose, breathing difficulty, and sneezing. Now the owner has called me a liar even though we sent pictures of the mold. LOTS of rules were posted everywhere, but we're stated so harshly it was an immediate turn off. Oh my. After the guest vacated the cabin they sent me a picture of what they said was "mold". Since we have a commercial grade dehumidifier I was stunned and immediately went to the cabin. What was on the wall and submitted as being "mold" was in fact a scrape on the wall. The guest had asked for money back. One- if there was an issue we let guests know to let us know immediately so that the issue can be addressed. I was told about the "mold" a few days after the party departed. Two- as the guest states and as we state- there is a commercial grade dehumidifier in this large bunk room. The unit was plugged in and working the morning of their arrival. Why it became "unplugged" is a mystery as these plugs don't just "fall out of the wall" Someone has to manually unplug it. If this was an issue then why didn't they plug it back in? Three- this is a "daylight" basement. Meaning half the ground floor is built into the earth and the other half is open. This is not a dark, dank, musty basement- the dehumidifier is in place to make absolutely sure there are never any issues with the cabin. Four- just as a precautionary measure, I had a mold expert come in and test the bunk room. No issues were found and the guest was notified of this. Six- the rules are "don't swing from the chandeliers and bag your trash". This is a four bedroom cabin that is someones property- of course there are rules. I would urge anyone else that rents to this party to make sure you are documented on everything. I had an air tight contract so the guest was not able to go back and "charge back" their stay as it became apparent they were just trying to get a free stay. We wish the guest the best but would not host them again. The cabin was excellent and very clean. The pool table and hot tub was great. Plenty of room for all of the family. Lots of deer and turkeys wandering around. Would recommend this cabin for a large family. Very nice cabin in a secure country setting. I LOVED meeting you guys- you were awesome! Thanks for such a nice review and come back any time! The house was all we could have asked for. Plenty of space for our family of 16. Plenty of beds for everyone. Our grandchildren, from 4 - 15, had plenty of room. Pretty good WiFi; DishTV; spacious kitchen; screened in back porch. The house overall gets an A+. The roads to the house, though, were dirt/gravel, and with no rain lately, they were dusty. We did not use the Rec Center, too pricey. So we went to one of the Carter's Lake recreation areas. Had to drive about 25 mins. to get there. That part was okay. Would we go back? No. While the accommodations were great, nothing we enjoy doing was convenient. If you're looking for a remote get away, this is just the place. Well I'm glad that the things I could control were okay. The house got an A+ which is what I think the review process is about. We are rural and yes we have roads that are dusty when it doesn't rain. I do not price the rec center and have no control over that- I drew this customer a map to go to the community pool which in my opinion is nicer and cheaper. We also have a brand new movie theater, bowling alley, a ton of wineries. the Appalachian Trail starts here- in our check in site we list 32 things to do in the area. I am glad they enjoyed the cabin. Has private hot tub. Pool table. Wi-fi. Pool card can be purchased for $85.00. Pool is 1 mile from cabin. OFF SEASON Dates offered for the pay for two nights and get one free special. Either book two nights and let me know what extra night you want (be sure it is open) or send me an inquiry and I will adjust. EXPIRES MAY 27, 2019 thanks!